Master the forces of magnetism as you enter a new realm in strategy board gaming! Welcome to the world of Polarityâ„¢, where magnetic forces combine with physical dexterity and strategic thinking to deliver a game playing experience unlike any other. Enter a new dimension as you learn to wield the invisible forces at play on the board. Force your opponent to disrupt the magnetic traps you have set - setting off dynamic chain reactions as pieces flip and collide - allowing you to score points to win the game! 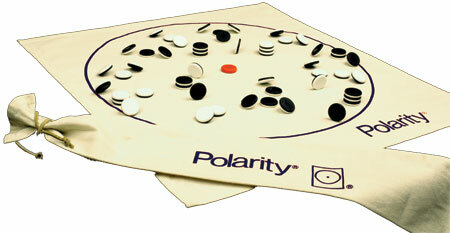 Never the same game twice, Polarity will entertain you, amaze you and challenge you for years to come. A great game with magnetic pieces that are balanced on one another. Be careful... Cause a reaction and your opponent gets to score. Stategy, skill, and dexterity all rolled into one very attractive game! This is a dexterity game. In general, I dislike dexterity games. Polarity is the one exception in my collection. The reason? There's plenty of strategy (and tactics!) in this game and the dexterity needed is rather minimal. The rules are simple and elegant. Just be the first player to place all 26 of your disks into the circle and you win! You may simply place the first handful flat. But from there on you must enter every disk by making it lean on one of your flat disks already in the circle. Most people (including kids) can do this with a few minutes practice before the game. But if you mess up while trying to lean a disk and other disks start clattering together or moving around, you must take those disks back into your reserve or they are turned over and become your opponent's disks! The tension rises to a climax as the board fills up! There's no luck in this game. It's all your achievement or it's all your fault. For folks age 8 and up. 4 to 7 year olds may find it harder to form leaners. The 3 and under crowd shouldn't even come near this game. They may try to eat the disks. This is one of Temple Games' finest offerings.